Five exceptional properties in Cumbria receive the highly sought after ‘Superior Quality’ status by assessors from Cumbria Tourism’s Quality Cumbria (QC) accreditation scheme. The Superior Quality mark rewards the ‘best of the best’, with the independent Quality Cumbria assessors examining four additional areas above the normal standard including; the overall product, information available to the consumer, the distinctiveness of the property and level of service. Those businesses who make the grade really do go the extra mile for their customers. There are currently 14 properties in Cumbria that have attained Superior status including the five new ones that achieve the accolade for the first time this year. Following a major redevelopment project on the site of the former Lonsdale cinema in Carlisle, The Halston Townhouses receive ‘Superior Status’, joining their sister property The Halston Aparthotel, which was the first property in Carlisle to receive the ‘Superior Quality’ status in 2017. The Sally, at Irthington has the honour of further raising the bar for accommodation in the Carlisle area. 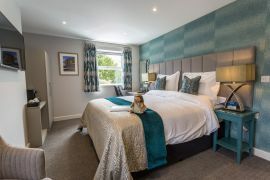 A former Victorian coaching inn, The Sally has recently been transformed into a modern, warm, friendly contemporary establishment, with tasty food and five stylish rooms. The Queens Head Hotel, Troutbeck reopened in April 2017 after a £2 million refurbishment, and offers a modern twist on a traditional Lakeland Inn. The Westwood – The B&B with a view, Cockermouth, offers wonderful, panoramic views to Lake District mountains, near to Solway Firth and Coastline. Whitbarrow Farmhouse Apartments, Penrith offer superb luxury self-catering in a converted farmhouse and feature hot tubs outside and an idyllic setting on the Eastern edge of the Lake District.